Easter Island is normally associated with its gigantic buried statues rather than its 5 reel adventure video slots. But here we have it, an online slot game based around the revered pacific archipelago. On the island the colourful birds are keeping the Easter eggs warm and when you see 3 bunnies across the reels this means you’ve entered our free games feature. Enjoy! Eyecon never ceases to amaze players with some of the best and most exciting slots experiences. Their dedication to innovation, variety and quality is easily spotted in the graphics, themes, gameplay and features of each of their new releases, as well as of older, now classic slot games. 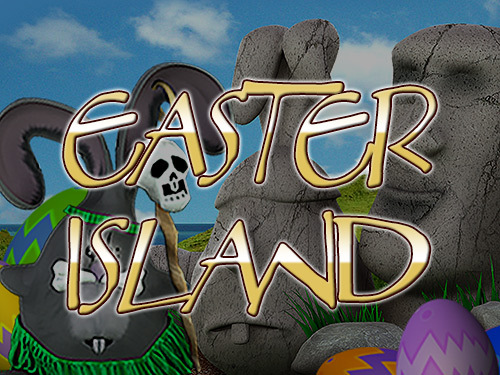 Easter Island is the perfect game for spring and the Easter season, but not only. Bunnies and Easter eggs interestingly mixed with tribal huts and skulls make this a universally enjoyable game during every time of the year. EasySlots has lots of promotions, click here if you want more. On an island resided by adorable wild bunnies, there’re sure to be lots of colourful eggs, treats and carrots, along with a friendly and cute atmosphere, among the vast vegetation of this beautiful place. The bunnies live in harmony in their huts, grow vegetables and go on egg hunts. Chicks can also be seen around the evergreen grass. Judging by all these elements, the theme of this slot game is definitely inspired by the Easter holiday, but placed in an atypical setting that is sure to leave players intrigued and pleasantly surprised, no matter when they’re playing. There’s plenty to love at Easter Island. 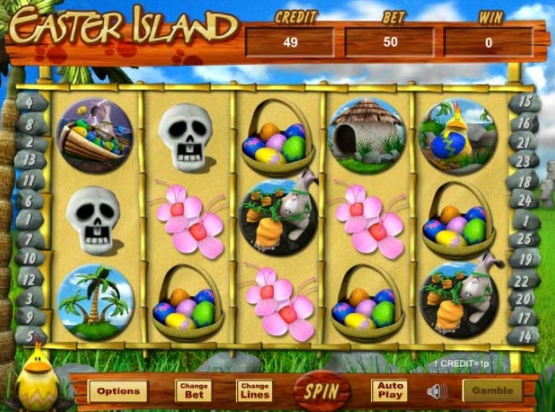 It has 5 reels and 25 paylines designed with impressive graphics and a wonderful background, featuring a gorgeous blue sky and vibrant vegetation, exactly appropriate for an island habited by rabbits. You can adjust the number of active paylines and place your bet starting from the minimum of 0.01 credits, having just enough versatility for you to feel comfortable playing. There’s a variety of symbols that range from baskets of shiny eggs, to massive bunny statues, beautiful pink flowers and silly looking skulls. These are all part of this bunny tribe’s culture. The Wild Card in Easter Island is the bunny symbol, which is of four adorable kinds: a male one, a female one, a healing witch, and a drummer. All have traditional tribal attire and dance around when you win. Either one of the rabbits substitutes any other symbol besides the Scatter, in order to form winning lines. If a combination of 3 or more bunnies occurs anywhere on the reel, you win up to 50 Free Games to enjoy, while dancing around with your new friends. During Free Games, all prizes are doubled. The Scatter in this Slot Game is the Easter Bird Symbol. When 3 or more of them appear anywhere on the reel, the Prize Pick Bonus is activated. Then, you are presented with several eggs holding Easter surprises, and you have the chance of picking from them a number equal to how many Easter Bird symbols you spun. Each pick has the potential of awarding you with up to 100x your initial bet. For more adrenaline, there’s a Gamble feature for you to use whenever you win, and risk getting double your prize or absolutely nothing. Easter Island is an innovative slot game with an endearing theme and flawless graphics that will have you playing again and again. Though perfect for the Easter season, there’s no reason not to enjoy it all throughout the year. Another great game is our Lights slot.